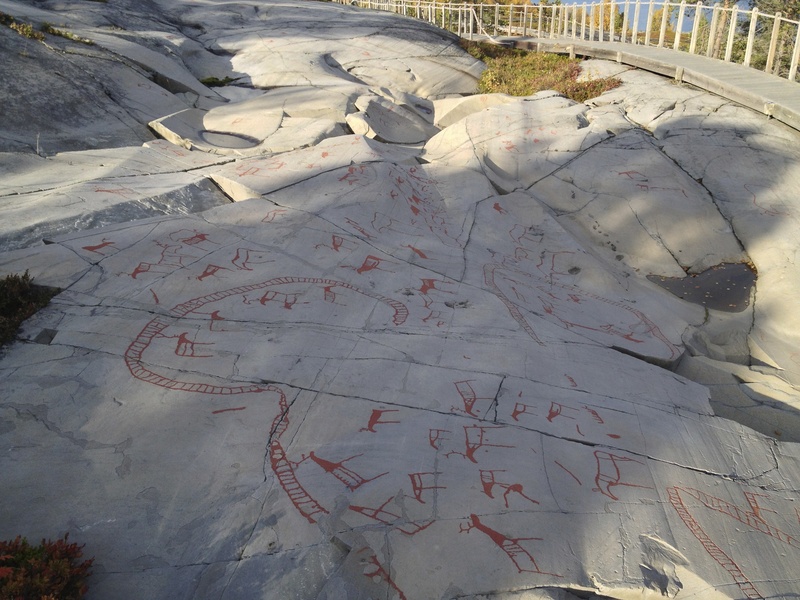 The Fennoscandian bedrock holds an extremely interesting interplay, the oldest solid forms on earth, and rich art, painted and carved onto it. Rock paintings and carvings are found everywhere in Scandinavia. The surprise is that the oldest cultures were born in the most north. The carved and painted tales of elk, deer, bear, whale and humans remain on the most solid and old bedrock in Europe. The rocks in Kilpisjärvi are around 500 million years old and are surrounded by the 2 billion year old bedrock of the Archean Lapland. Back then, with the Cambrian revolution, when the number of living species grew exponentially, the present Kaledonidic sediments, visible on top of Saana mountain in Kilpisjärvi, began to fold and penetrate to the east and pushed themselves on the Archean bedrock. The group will go back on two different time scales into deep geological and deep human time to explore the beginning of life on earth and the beginning of art. Specific sites of geologic and human activity will be visited and act as starting point for deeply human questions. Artist curator and teacher. He is considered as one of the pioneers of bioart. From 1985 he has produced “living art” by microbes and chemicals. One of his classics is the “Swan”, a biopiece where the Swan sculpture is slowly growing feathers over it, and at the same time building a microclimate in its vitrine. Kare has shown extensively in Europe and the USA. He has been elected to the board of the International Art Critics Association, founded the New York Foundation for the Finnish visual artists and was the rector of Tampere School of Art and Media. She completed a Master of Science (Biological Arts) in 2012. She has worked variously as a pizza delivery driver, a fruit and vegetable stacker, a toilet paper packer, a researcher in compost science and waste management, a honeybee ejaculator, an art gallery invigilator, a bookkeeper, a car detailer, and a life drawing model. Tarsh is currently a candidate for a PhD (Biological Arts) at SymbioticA UWA where her current research is concerned with gentleness, the aesthetics of interspecies relationships and the human as a multispecies ecology. She is particularly enamoured with Candida albicans. Karolina Sobecka works with animation, design, interactivity, computer games and other media and formats. Her work often engages public space and explores the way we interact with the world we create. Karolina received her BFA from the School of the Art Institute of Chicago and her MFA from Calarts in Experimental Animation/Integrated Media. She has also studied and taught in the University of Washingtonâ€™s Digital Arts and Experimental Media PhD program. Karolina´s work has been shown internationally, including at the Victoria & Albert Museum, MOMA, Beall Center for Art + Technology, ISEA and Medialab Prado. She has received awards from, among others, NYFA, Creative Capital, Princess Grace Foundation, Rhizome, Platform International Animation Festival, Vida Art and Artificial Life Awards, and the Japan Media Arts Festival. An art student concentrating on topics of art & science, art theory and art pedagogy. She has studied a minor degree in biology, which has strengthened her perspective on issues of ecosystem and ecology. In recent years circulation of energy and material in the ecosystem has been in the center of her art, especially in sculptures which combines traditional building materials with living fungi mycellium. Another focus has been the topic of scales and proportions. One installation, for example, juxtaposed sculpted 3D-maps of mountains and rivers with the photos of small worlds of molds. Ole is a software artist, computer programming is the primary material for his artistic practice. He has worked with real time video analysis as well as programmable large scale installations. His installations can work as interactive spaces for theatre and modern dance. He teaches at theatre schools in Denmark and Norway. He is involved in research programs at the IT University of Copenhagen. Currently he is involved in the long project ‘Longing Fast Forward’ following a year in a Northwestern Greenlandic settlement through an artistic research station. He works as part of Recoil Performance Group and Illutron. Artist Jukka Hautamäki (b. 1971), lives and works in Helsinki, Finland. Hautamäki works with consumer goods, electronics, sound and video. His works, which are often presented in the form of an installation, are supported by sound and visual imagery. Hautamäki is interested in the interaction between nature and man, observing things such as how the wind expresses itself or how the rustle of tree branches sounds without the branches. The emphasis is often on the reciprocal dynamic between the individual works and the overall mood. His installations, video and sound works have been shown in Europe and North America.